I shall start with Checkerboard Composition with Light Colors. 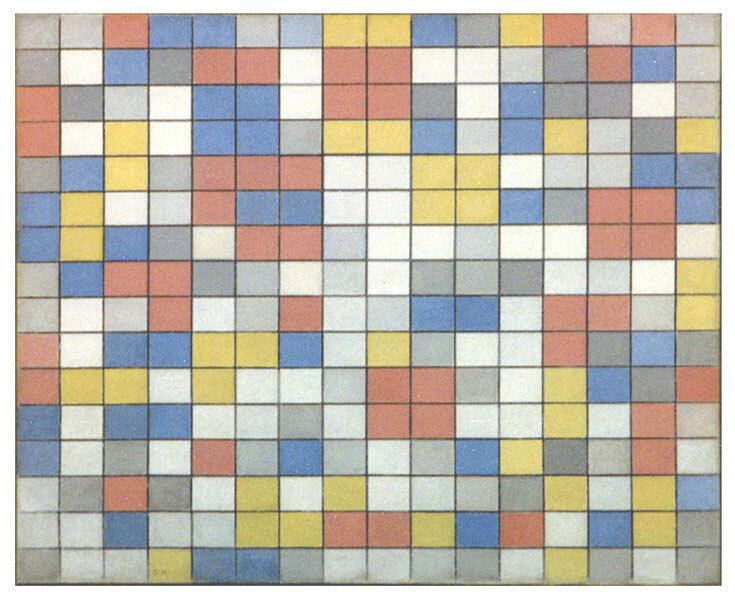 Mondrian draws onto this canvas a new schema in which the linear segments of previous compositions (see here) become continuous straight lines running across the entire surface of the canvas, giving the composition a more dynamic appearance. Each side of the painting is divided into 16 units so as to divide the surface into 256 rectangles of the same size with the same proportions as the canvas. This gives birth to a wholly regular and constant layout in terms of form that is transformed by the alternation of color into a whole of variable appearance. We observe a multitude of planes colored yellow, red (a light red verging on pink that I shall in any case call red), and light blue mixed with other planes of gray and white. At least three different shades of gray can be seen. The straight lines are a darker gray that becomes almost black in some sections. The rectangles alternate with one another to create a variously articulated space. The colors are not flat and uniform, as they appear in standard reproductions. There are extremely subtle variations of every primary color, as there are of every shade of gray. On observing the multitude of colored rectangles, we note that two, three, and even four rectangles of the same color gather in some areas to form larger units. We see a larger rectangle of a yellow color, one of blue, and three of red. The composition is a succession of sequences made up of small rectangles of different colors that finds a moment of comparative rest in the larger rectangles. The ephemeral progression of new events (the small rectangles) is transformed in the larger units into a space of relatively greater duration. Note how the opposition between vertical and horizontal lines manifests itself with greater clarity and balance in a homogeneous field of color like that of the larger rectangles. The perpendicular opposition instead proves less stable when the colors change around the point of intersection between vertical and horizontal. What appears in synthetic and unitary form in the larger rectangle is unbalanced elsewhere by the various colors gathered around the points where the lines intersect. It is color that highlights the most balanced syntheses of the two opposite directions in this composition. Having identified a larger unit, the eye spontaneously seeks others and is obliged in this search to address many other situations involving the absence of one or two basic units needed to form a homogeneous rectangle, that is to say, loosing the perfect equilibrium between horizontal and vertical. In seeking larger rectangles of a single color we contemplate the virtually infinite variation of entities born out of different combinations of same elements. 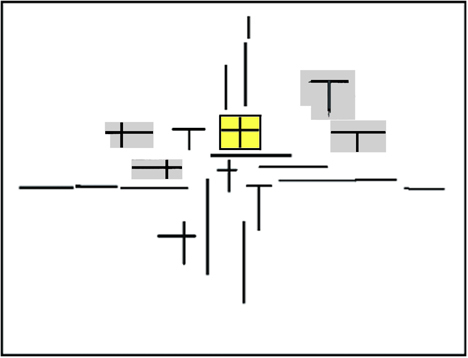 The heterogeneous appearance generated by the quick succession of small rectangles becomes more homogeneous in the larger rectangles; from the ethereal and random to greater constancy and stability before returning to the haphazard succession of different things and moments; from the variety of the external world to mental syntheses that then open up again to multiplicity. Being abstract, the composition represents both the variety of the natural landscape and the still more dynamic variety perceived in the urban landscape. 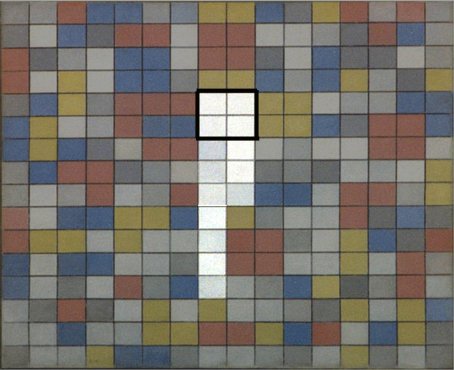 In addition to the five larger rectangles expressed in the three primary colors, Checkerboard with Light Colors presents one in white that also contains black lines forming a sign of equivalence. This is the only white rectangle of larger size present on the canvas. The white rectangle appears to be generated through a progressive purification of the colors that takes place along the vertical axis running through the center of the canvas. The vertical field can be seen as a dynamic upward progression leading to the white rectangle. Its position is perfectly central with respect to the sides and slightly raised. This recalls the development of the central square in Pier and Ocean 5 Mondrian painted in 1915. Like the square of Pier and Ocean 5, the white rectangle of Checkerboard with Light Colors expresses a unitary synthesis of the composition. It is in that point that the entire surface attains a synthesis and equilibrium of opposite values in terms not only of form (horizontal/vertical), as we see in Pier and Ocean 5 and in the other yellow, red or blue, larger rectangles of Checkerboard with Light Colors, but also in terms of color (black and white). I shall endeavor to explain. The painter still distinguishes in this phase between color (yellow, red and blue) and non-color (white, black, and gray) seeing the first as a plastic symbol of the natural and the second as symbolizing the spiritual. 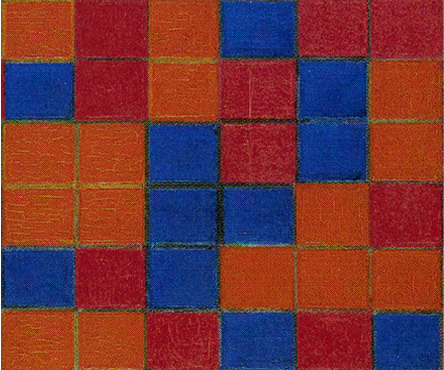 For Mondrian yellow, red, and blue constitute a plastic symbol of the purest and most intense colors in the world. He uses the three primary colors here to express contrast and diversity, and white, black, and gray to produce an equally broad range of variation that appears, however, more homogeneous than the contrasting variation generated with the primary colors. On observing the range of grays, we note that the darkest shade appears to be as dark as the blue, just as the lightest shade of gray appears to be equivalent to yellow. It is as though the range of the three primary colors had been transposed into a parallel range of grays that intrinsically appear more unified than yellow with respect to red or red with respect to blue precisely because they are different shades of the same "color". The artist appears to be seeking a common denominator in terms of color. The colors and “non-colors” of Checkerboard with Light Colors are therefore to be seen as a whole that, on the one hand, blossoms in a showy and discordant variety of colors (the three primary colors) symbolizing the variety of the world and, on the other, is recombined in synthesis through the most homogeneous variation of grays between the two opposite values of white and black, which attain unitary expression in the central rectangle. Through the "colors" of the spiritual, multiplicity of the natural becomes unity in that point for a moment. 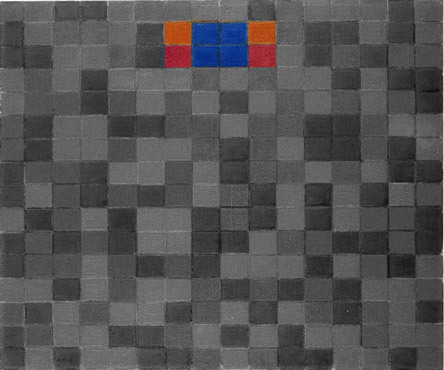 In Checkerboard with Light Colors Mondrian rediscovered in a new form the unity that, after Pier and Ocean 5 (1915), had been dissolved in works where a variety of colored rectangles lacked unity (see here). This unity was now visible once again and expressed, unlike Pier and Ocean 5, in a space made up entirely of color. Looking at Checkerboard with Light Colors we are faced with a space that is exposed, on the one hand, to the pressures of the boundless, multiform and colorful physical extension of reality (which is expressed also through the dynamic continuity of straight lines) and tends, on the other, to concentrate inside the painting in an ideal synthesis. The human search for unity (be it the idea of a God or the unifying theories of science) is always counterbalanced by the multifarious aspect of nature and by the unforeseeable evolution of life. Checkerboard with Light Colors presents both aspects. 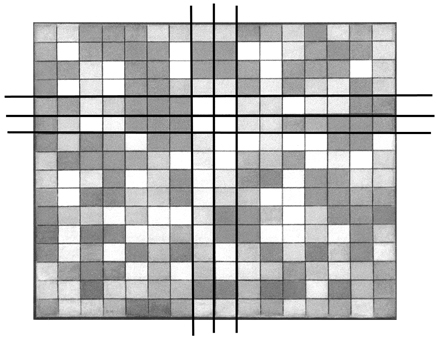 Another substantial innovation of Checkerboard with Light Colors with respect to Pier and Ocean 5 lies in the fact that the synthesis produced in 1919 appears to be ideally connected with real physical space by means of the straight lines, which express a sense of continuity that seems intent on expanding beyond the finite boundaries of the canvas. The synthesis of 1915 instead appears to be suspended in a universe that is still metaphorically enclosed within an oval. 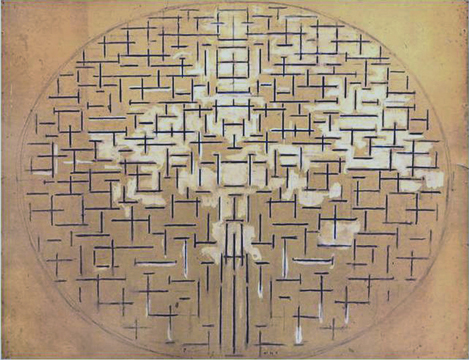 Through the lines, which continue uninterruptedly, the subjective unity (the white rectangle) is ideally connected with the assumed objective unity of nature, an immense space that can no longer be represented as a simultaneous whole (the oval) but remains clearly present to the painter's mind. While the oval served during the cubist phase to express an idea of the whole, it appeared at the same time as an overly absolute form. Mondrian sought to address the absolute and the universal but starting from the relative and the particular, i.e. from the real condition of everyday existence. 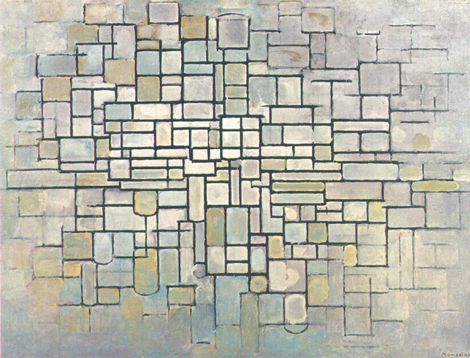 In Checkerboard with Light Colors the totality of space is now expressed through the continuity of the lines, which is why Mondrian was to abolish the use of any frame around his canvases in the subsequent works. The frame interrupts the ideal continuity envisaged between the work of art and real life. It is worth noting how six years earlier Mondrian had already used a central rectangle to suggest a synthesis of the composition. All around the central rectangle of Composition N. II we see an endless variation of horizontal and vertical entities prevailing over one another. 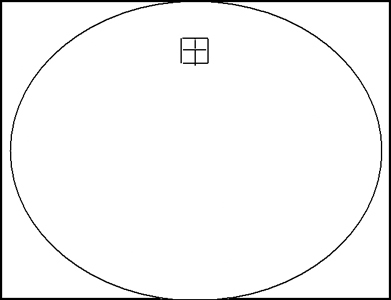 Some enclosed areas (marked in gray) show attempts of a more balanced relationship between opposites which is then fully attained in the central rectangle. 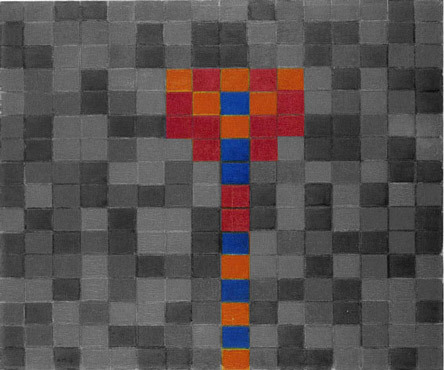 This fundamental idea is expressed in Checkerboard with Light Colors with the larger colored rectangles where the opposite directions do achieve equilibrium which is, however, only a partial one, either yellow, red or blue, before merging into the central rectangle which evokes a synthesis of opposites in terms both of form and color . Let us now consider the second checkerboard, known as the Checkerboard Composition with Dark Colors. This version starts from the same formal layout as the version with light colors. Once again we see a regular layout made up of 256 small rectangles of the same size, a heterogeneous set of entities that combine in some areas to form larger units of the same color . Two are yellow and two blue in color, whereas red never attains the synthesis of a larger rectangle. 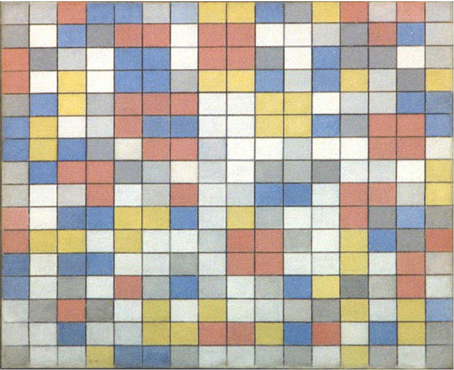 Unlike the light-colored version, the dark presents only what Mondrian referred to in that phase as "color", whereas "non- color" (black, white, and gray) is wholly absent. Only a few short stretches of line appear to be black. All the planes are yellow (a golden yellow verging on ocher), red (almost amaranth), and dark blue. The chromatic substance is denser and richer than in the version with light colors. The painter thus appears to accord priority in this work to matter and color, i.e. to what he identified most with the natural world. Following the changing rhythm of the colors, we observe some small rectangles that are symmetrically arranged in the central area. Moving upward from the bottom, we see a yellow rectangle alternating with a blue rectangle, then two red rectangles and two blue rectangles, while the symmetry expands on the sides. The symmetrical arrangement exists but is not immediately visible. While the Checkerboard with Dark Colors thus lacks a unity of opposite values (black and white) as we have seen in Checkerboard with Light Colors, we can see in its place an area of space that, though entirely colored, maintains greater homogeneity with respect to other areas of the painting, where everything instead changes at random. Where a unitary synthesis of opposite values is seen in the version with light colors, there are now the three primary colors, which appear with their symmetrical arrangement to provide the element of constancy required by the consciousness on beholding the ever-changing appearance of the world but without concentrating to form a single white plane, as happens in the other checkerboard composition. The unitary synthesis of Checkerboard with Light Colors appears to open up to color here and spread itself all around. The black and white unity now opens up to the variety of intermediate hues (yellow, red, and blue); the colors of the spirit open up to the three primary colors that symbolize the natural world in the Neoplastic language. The opening up of black and white to the primary colors will be the guiding motif of Mondrian's subsequent work, from 1920 up to 1942. We are thus faced once again, but in a completely new form, with the space of the Pier and Ocean 5. Here too, around a central axis running from the bottom to the top, the composition suggests progression toward a certain order. This is achieved exclusively through form in 1915 while it is mainly color which conveys the same idea four years later. Observe he larger blue rectangle in the upper central area of the composition. The pair of small rectangles (yellow and red) on its left is repeated in identical form on the right. It is really as though the painter were seeking here to express a unitary synthesis of yellow, red, and blue. 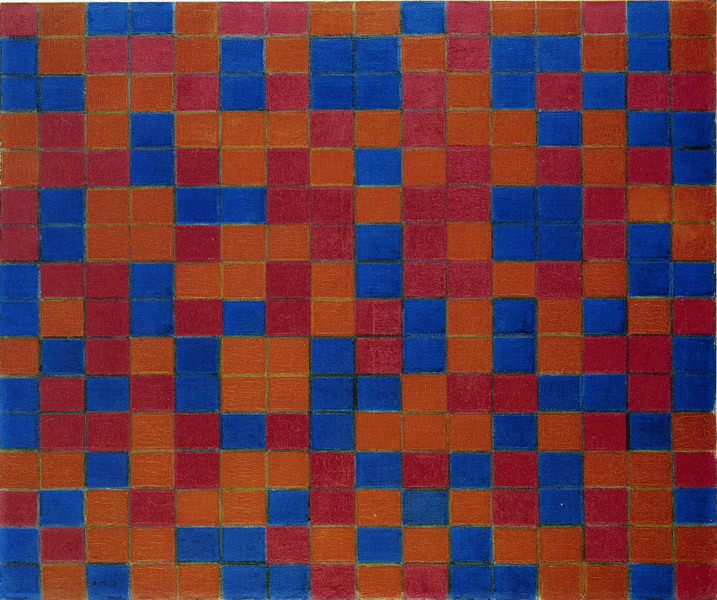 Through its great symmetry and the aggregation of the three colors, the central area of this composition suggests a certain tendency toward synthesis that, however, remains open with respect to the light- colored version. There appears to be a fusion of unitary (black and white, symbols of the spiritual) and manifold aspects (the three primary colors, symbols of the natural) in this work. There is also another noteworthy characteristic. As pointed out above, while the lines in the previous canvases intersect and limit one another (see here), they extend in the two Checkerboard Compositions to give the whole composition a sense of open continuity. However, on observing the two checkerboards at the same time, we can see that the lines of the version with dark colors display less continuity than those in the light version. The lines are almost completely uniform in the light-color checkerboard but show a slight variation in thickness in the dark-color version as well as changes in hue, ranging from a dark gray verging on black to shades of brown and ocher that almost arrive at yellow. The picture here shows an enlarged detail where this discontinuity can be seen. With respect to the version with light colors, the lines in the dark version seem to be divided into finite intervals or linear segments. Through discontinuous values of thickness and color, the straight lines of the dark version seem to partake of the finite and relative nature of the rectangles more than in the version with light colors, where the lines appear to be more absolute and their continuous, uniform space to be uncontaminated by the changing and discontinuous space of the planes. The discontinuous lines of the dark grid seem designed to suggest a point of transition between the virtually infinite space of the lines and the finite dimension of the planes. These two checkerboard compositions and especially the dark-colored version constituted Mondrian's first exhaustive formulation of what was to become the Neoplastic vocabulary underpinning all the subsequent work, which can be summed up as the interaction between lines, segments, and planes. and "non-color"); between infinite space (lines) that becomes finite space (segments and planes) and then expands to the infinite. The dynamic and multiform aspect of natural and/or urban space is transformed on the canvas into a whole endowed with greater synthesis and equilibrium before returning to a dynamic state. The canvas serves as a model of space in equilibrium between disharmonies of real space and harmonies of plastic space.